Cementing Brushes - The last step! LEAD NIPPERS are the quick and easy way to cut lead came. They resemble ordinary wire cutters, but their specially hardened and flush ground cutting face nips your lead neatly. Cuts miters without any trouble. Spring loaded jaws. Use these for cutting lead ONLY. Cutting other materials, even soft wire, may cause the hardened cutting edges to chip. These entry level lead cutters do a fine job. Cuts lead came neat and clean. 6" long overall. Fan Out brand nippers are known throughout the world as the finest quality at any price. 6” long. Every professional studio should have one! LEAD KNIVES are the traditional method for cutting lead. Knives work better than nippers on wide lead. With weighted end for driving horseshoe nails. Hint: keep knife sharp using a sharpening stone, and then rub on block of paraffin to help the knife slip through the came. Super sharp stainless blade will take and keep an edge. The Web Master bought his Don Carlos back in the 70's, and still has it handy. You will find this knife on the benches of big name studios around the world. If you are working seriously in lead came, you want this tried and true tool on your bench. Sharp steel blade makes this a better than average student knife. This is the easy way to neatly cut came. Especially useful for mitering corners or to cut many pieces the same size. 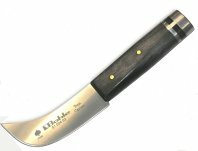 Very sharp blade with wooden handle makes for effortless cutting. Shown ready for 45° cut. LEAD WORKING TOOLS make working in came easier and quicker. This is a highly effective yet inexpensive lead vise. Spring loaded jaws hold your came in place as you pull. Use for STRAIGHTENING lead came. Don't STRETCH came, just pull hard and long enough to get the lead straight (pulling too far takes the temper out and narrows the channel). Holds lead securely; won't pinch fingers. With mounting hole to fasten to your work bench. An effortless way to stretch lead came. Mount the Stanton Stretcher at one end of the table, and a regular lead vise at the other end. Place the lead in each, and stretch. The leverage of the Stanton Stretcher effortlessly straightens your came. NOTE: be sure to stretch only until the came is straight. Overstretching will greatly weaken the came. This quality tool is made in the USA by Glastar! The Adjustable Rail System works with your Stanton Stretcher to help you stretch lead of any length. The sliding lead vise allows you to stretch a piece of lead from 4" to 6' and anywhere in between. The Rail System is purchased as an optional accessory for the Stanton Stretcher and does not include the Stanton Stretcher. This quality tool is made in the USA by Glastar! Comes with hard plastic and soft rubber faces. Use rubber face to tap glass in place when working in lead came. Hard plastic face drives horseshoe nails. Sturdy handle. 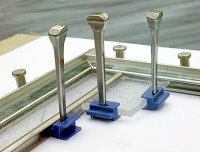 This is an all around tool that is used for opening lead channels and for trimming away excess putty and cement. Approx 5" long. is a handy, multipurpose fid, 8" long. Opens lead came, burnishes foil, scrapes putty, lifts glass into place etc. Looks funny, but works serious. is for rubbing your foil tight to the glass or for working with lead came. Sturdy white nylon, 8" long. ZINC, BRASS AND COPPER WORKING TOOLS are specialized for working with these stiffer styles. THE LI’L NOTCHER is a cutting tool that puts a notch in 1/8” U brass, copper or zinc channel. It allows the came to go around sharp corners without puckering. It saves you having to cut or miter the channel to make corners when using 1/8” channel (U170-Series cames) for borders. CLICK HERE for more information and to buy on line. 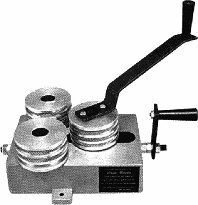 The Gryphon Came Saw is made to quickly and accurately cut your Zinc, Brass or Copper Cames - plus steel rebar - with its efficient abrasive blade. An optional toothed blade will make fast work of lead came. PATTERN SHEARS remove a small strip from your paper pattern to allow for the heart of the lead, or the foil on the edge of your glass. We have quite the assortment of pattern shears - so many they have their own page. CEMENTING BRUSHES are used in the last step of a lead came project - cleaning excess cement from the panel and burnishing your lead came to a deep, lustrous finish. Small Cement Brush - 1-1/4 x 4-1/2 inches with 1/2 inch long bristles. A best seller. Made in USA.